Okay. It’s happened to all of us knitters. We are merrily knitting along on that special project, and we get the news that someone—a relative, a friend, a relative of a friend, a friend of a relative—is expecting a little bundle of joy. The special project gets set aside, and out come the pattern books and pastel yarns. This happened to me several years ago in the midst of the Rose-of-England KAL. It was late February. I was going like gangbusters, making all kinds of fantastic progress on the ROE, when, bang, out of the blue, the DH tells me that not one, but two of his boss’s daughters were expecting babies, one in July, the other in August. So I set aside ROE for six weeks while I made two baby blankets. You know where I’m headed with this, don’t you? 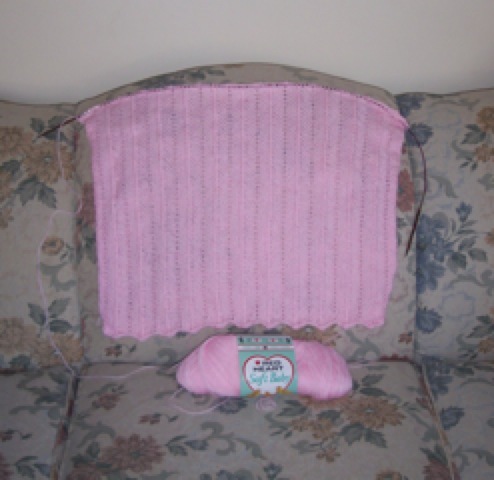 All of my current projects have been supplanted by the blob of cotton candy pink you see draped over the living room couch in the photo. The baby blanket is a simple chevron pattern with a nice little eyelet effect and the yarn is Red Heart Soft Baby—not bad for <ugh> acrylic. My mother started the blanket. But then she became ill and can no longer knit. Naturally, I offered to finish the blanket for her. So now I’m a knitter on a mission. I must complete the blanket as soon as possible. All WIP except cousin Vickie’s lucky Irish socks, which will definitely not be finished in time for that most important of holidays, St. Paddy’s Day, and the upcoming Orkney Pi KAL have been set aside for the duration. The lucky socks have been relegated to Sunday nights and Masterpiece Theater’s The Complete Jane Austen. Last night was the conclusion of Pride and Prejudice and what a happy ending it was. I’ll also make time to work on the Orkney Pi a little, but cotton candy pink will be the headliner. Lucky for me my mother chose a mindless pattern that I can work on while reading Common Dreams and Truthout on the Internet. I’ll have that puppy done in no time. And now–back to my knitting.